Hi everyone! I hope you're having a wonderful February so far. I can't believe January is over, but I have absolutely no complaints about getting closer to Spring and Summer. Valentine's Day is coming up, and my husband and I have always struggled with giving each other great gifts. We're the kind of people who usually just get a joint gift for the house, or buy ourselves something using the other person's money and call it a gift. My husband has been able to surprise me a few times though, which is a great feat on it's own because I am not an easy person to surprise. 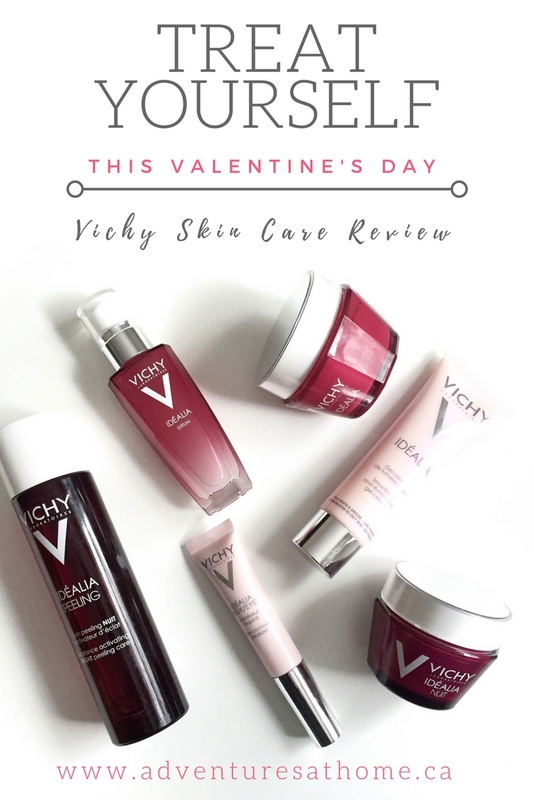 Recently I was sent the entire Vichy Idealia line to try, and I cant help but think of what an amazing Valentine's gift this would be! If you're like us and buy gifts for yourself, or drop major hints to your significant other of what to get you, check this out! If you don't have a significant other, treat yourself! You Deserve it! I was SO excited to receive this amazing line of products from Vichy a few weeks ago. 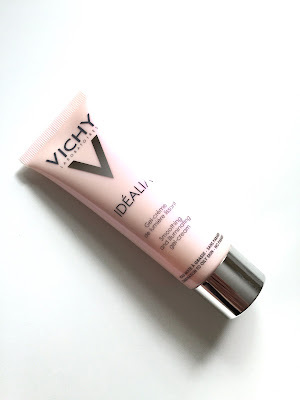 I have been using Vichy foundation for years, but have never tried their skincare. To be honest, I did not have a regular skincare routine before starting this line. 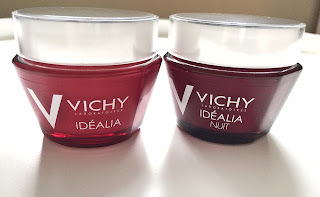 The Vichy Idealia line is marketed towards women in their 30s, and I just turned 28 so it's a perfect fit for me (and a perfect time for me to start taking care of my skin). I use this every morning after I wash my face. My skin type is normal-dry so I always need some kind of moisturizer. I love this because I can put my make-up on right afterwards and my make-up still stays on all day. I've noticed a difference in my skin since using it because my make-up sometimes used to look dry and flaky by the end of the day, and now it doesn't. Idealia Night is a lot like the day cream. My skin feels moisturized and dewy in the morning, which I love. A little bit goes a long way. I've been using it for almost a month and have not even made a dent in the amount of product in the jar. I would definitely repurchase. This gentle night peel uses glycolic acid to even out skin tone and reduce the appearance of wrinkles. It's extremely gentle and honestly just feels like I'm rubbing water on my face. I prefer a bit of a tingle or sting when using a gycolic acid peel because for some reason I associate that with how well it works, but I've really noticed a difference since using this. I LOVE this! It's supposed to reduce the appearance of pores, which I really need. It feels super cooling and smooth going on and works well under make-up. 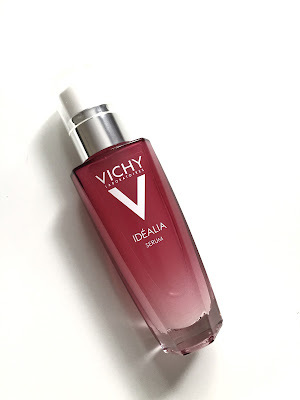 This serum is supposed to "recharge skin with radiance" and it does just that. I don't love how it feels going on because it's more of a gel and I prefer a cream like texture, but it definitely makes my skin feel and look great. 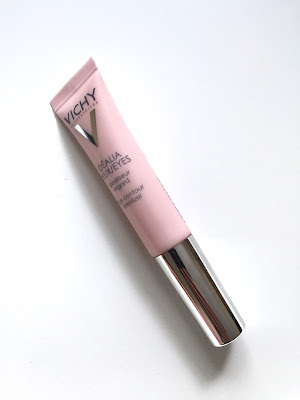 This is supposed to brighten and reduce the look of dark circles and fine lines. I don't have fine lines yet and my dark circles usually aren't bad, but I noticed that it definitely brightened my under eye area. I used it before my make-up for a little extra brightness. Comment below and tell me what your current skincare routine is! What order do you put them in when you put them on?